So I'm staying in Nashua, New Hampshire for the next couple of days. Nashua is apparently the 27th safest city in the USA (http://en.wikipedia.org/) which is actually code for it being pretty dull. It also has a reputation on the Republican presidential campaign trail...but you don't want to hear about that do you? However, the trips I make out here mean I get to indulge in the local food and there are actually a few good restaurants here. Tonight I'm not at one of them. 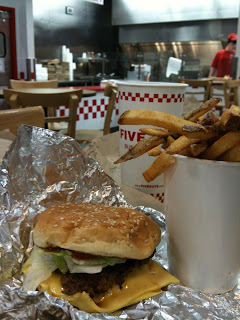 Although at Five Guys (http://www.fiveguys.com/), they actually do a very good burger indeed. As you enter the establishment in a strip mall off one of the highways, there are large sacks of spuds under a sign telling you which variety, invariably from Idaho, they are frying that week. They also have peanuts in large sacks that you can grab a handful of while you wait for your cooked-to-order burger to achieve the right greasy consistency. I however can't bring myself to crack the nuts. No, not because of a nut allergy (I pity those poor people) but because of food samples in London's Chinatown. Bear with me, as the memory still brings on bilious episodes. So the story unfolds like this: we sampled a cracker smeared with a smooth caramel paste from a tray offered by a lovely Chinese girl, which in hindsight probably had dozens of other sticky fingers poking around on it. Or a few fingers that hadn't been washed. In days. The snack was delicious actually, sweet but not cloying. I think it was a favourite in Malaysia. Riding the sugar rush we purchased the three for two offer along with other provisions for that nights dinner (which happened to be a Kylie Kwong). To make a gory story short, an evening of toilet bowl hugging followed with the two of us fighting for space and not always winning. But we are here for the burgers, not the monkey nuts nor the vomitorium story. My stomach is jet lagged and a burger should hit the spot. The Five Guys burger is a bit of a classic in my book, but perhaps not on the same level as MEATLiquor or even Byron. Perhaps it's the environment. Or the peculiar joy I find in watching the locals - a varied clientele who can be just on the far side of white trash. This is a regional town after all. The menu is simple and straightforward. Each burger is two patties strong and you can choose from a list of a dozen or so extras, at no extra. I opt for simplicity and have a cheeseburger with lettuce and tomato. My colleague opts for the lot, except mustard which makes me laugh. The burger hits just the right notes for me, although lacks the grilled smokiness of the aforementioned London burger joints. Soft bun, juicy meat, american processed cheese. The fries, still with the skin on are plentiful. Simple, yet effective. Perfect. Satisfied with the food, we venture out past the sacks of spuds into the cold. That reminds me. I should tell you about the MEATLiquor chilli burger too. Oh. My. God.